Gun control advocates believe that if they pass laws to restrict the access of firearms, crime will decrease. However, as ingenious inventors and builders around show that mere laws cannot stop human creativity and the ability to make do, especially as it comes to the need to self-defense and to hunt animals for food. They have resorted to making homemade guns to meet their needs. How easy is it to make a weapon? It’s so easy you can make a deadly weapon from components easily found at a hardware store. You’re probably thinking “Oh wow Kevin, muzzleloaders were the thing….back in the 1800s.” Well, just as firearms in general have come a long way since then, homemade firearms have come along as well. Not only can homemade gun makers build shotguns, they can also build submachine guns as well. Look at this example from Poland. Finally, homemade gun makers can even make full-size machine guns. Here’s an example of a machine gun that is fed by common 12 gauge shotgun shells. All the laws in the world will not stop criminals or anyone else from that matter, from building or acquiring the firepower they need to defend themselves or to do terrible things. Instead of forcing people to rely on such crude devices, they have the right to access the better made means of self-defense. Aren’t Libertarians Being a Bit Hypocritical and Hoplophobic? One custom that gang members enjoy is posing with weapons. I suppose that the pictures serve a purpose of both reassuring members of the gang about their power to hurt people while acting to intimidate not only the innocent people the gang prays upon, but also rival gangs. The Richland County Sheriff’s Department has produced one such picture, showing an armored vehicle with a.50 cal machine gun mounted on it, while members of the gang’s most violent gunmen pose with semi-automatic rifles and body armor in threatening poses. Given the comparative peace and cooperation that the Richland County Sheriff’s Department has with the gangs that dominate neighboring counties, it is clear that the purpose of this weapon is not to defend itself against rival gangs like the Fairfield County Sheriff’s Department. By process of elimination we can guess that the primary purpose of this weapon is to threaten either innocent people residing in the county, or small gangs that have moved into niches opened by the Richland County Sheriff’s religious war on intoxicants, dog-fighting, prostitution and the like. Many libertarians are outraged; they point out that a weapon which is impossible to aim accurately – you start firing and walk the bullets in – whose bullets will go through concrete walls and still have a lethal amount of kinetic energy is absolutely incompatible with modern policing theory. They are, to a point, correct; under the theory of modern policing, police are supposed to use the minimum amount of force required to protect lives and property, and that force is supposed to be narrowly focused only on targets that require it. OK For Private Citizens, But Not Government Officials? The .50 cal rifle, being almost worthless for hunting (blowing a part your prey leaves very little cookable meat), overkill for self defense, and providing just as much sport as a smaller gun when it comes to plinking away at targets, is similarly inappropriate for the regular citizenry. If we are to defend the individual’s right to own and play with such a monstrous weapon as a .50 cal rifle, shouldn’t we extend the same courtesy to someone who happens to be a policeman? Why can we trust a guy insane enough to buy a .50 cal rifle at a cost of I don’t know how many tens of thousands of dollars while not trusting a guy who happens to join a police force? The answer of course is that the private citizen is far less likely to misuse their weapon than a policeman. This is manifest from the double standard that exists when policemen unlawfully shoot someone as compared to when a private citizen unlawfully shoots someone. In fact, one can contrast the double standard that exists when in an armed confrontation with police when a policeman unlawfully shoots someone with what happens when a private citizen shoot a policeman lawfully. There have been many instances when policemen have stormed a property without a warrant or if they have a warrant without divulging to the property owner that they had a warrant or even that they were police. Furthermore, a significant portion of those raids have been on the property of people who had no reason to expect a police raid of any kind, seeing as they had no involvement with illegal drug trade. In a subset of the latter group of raids, gunfire has erupted between the people on the property who thought they were being attacked by a criminal gang unaffiliated with the police and the police themselves. Regardless of who fires first, regardless of who initiates the fighting or how quickly the residents surrender, the outcome is almost always the same: A police man who shoots someone unlawfully will be exonerated of criminal wrong-doing while the homeowner who shoots a policeman lawfully will generally face capital murder charges. The most a policeman has to fear is that they may lose their job. They rarely face prison time, and that only in cases where the shooting is so vile, such as gunning down an octogenarian grandmother in her bed and leaving her to bleed to death, that the police face a revolt by the citizenry. This is true even in situations where they only weapons brandished were in the hands of the police, where the only shots fired where shots out of guns in policemen’s hands, where the only people shot were women and children cowering on the floor. In effect, the police can be assured they will face no prosecution. Contrast this with cases where residents have resisted until they discovered they were facing police armed with a warrant, and then cooperated. If they have killed a policeman, as did Cory Maye, they can face a capital murder charge. If they merely fire back without hitting anything, they usually face attempted murder charges and aggravated assault charges. They will do jail time. Absent any mechanism for holding “law enforcement” equally liable as the private citizenry for the people they kill or injure, stringently limiting the types of weapons police may possess does seem to make sense. What About That Endangered Creature – The Law Abiding, Decent, Policeman? However, we should not sacrifice the principle that people should be able to legitimately own the weapons they feel they need to protect themselves and their property merely because we are prejudiced against them. While many policemen are people who want to predate on their neighbors, but decide to select a safer, if less lucrative, form of criminal activity than joining the mafia or MS-13, there are many decent people who chose to join the police because they wish to be a force for good, and want to protect lives and property. Given the territorial monopoly that the gangs of police hold, any person who finds murder abhorrent and decides to dedicate his or her life to bringing murderers to account for their crimes and to deter would-be murderers from committing future murders will have to join some gang of police to practice their avocation. Should we disarm and condemn them because they took the only avenue open to them to accomplish their honorable purpose? I say no! While we can guess that the Richland County SWAT team will injure or kill innocent people should they decide to fire that weapon as part of their duties, we don’t know that they will. All we can do is react to the crimes they commit, not sanction them prejudicially for the crimes we fear they might commit in the future. 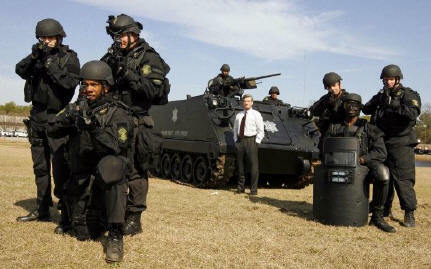 Applying the same laws to the SWAT team (or any other policeman) that are applied to the Brinks Armored Car guard would go a long way to eradicating abuses, and would do much to ensure that the weapon sat gathering cobwebs in some garage somewhere. My thoughts about the name for the machine gun may be found here.